April 19th, Jining City Federation of Industry & Commerce (Chamber of Commerce) 13th Congress held in the Yunhe Hotel, Nearly 400 members from the city attended the meeting to discuss the the next five years' development plan.The meeting examined and approved the work report of the twelfth session of the Executive Committee, elected a new leadership team. Li Kexue was elected as the new president of Jining City Federation of Industry & Commerce (President), China Transport Group Chairman and General Manager Qu Qing was selected as Jining City Federation of Industry & Commerce Committee, Jining City Chamber of Commerce vice president. Deputy Secretary of the Provincial Federation of industry and commerce, vice chairman Sun Zhanjia, Municipal Committee, United Front work, Party committee of the new high tech Zone Secretary baishan, Wang Chengyu, the deputy director of the Municipal People's Congress, the chairman of the Municipal Federation of industry and commerce, Vice Minister of the United Front Work Department of the city, the City Federation of party secretary, executive vice chairman, Party Secretary of the non-public economic organizations in the city and Municipal CPPCC Vice Chairman Ni Lijun attended the meeting. The meeting was presided by Wu Jiwen, the vice mayor of Jining municipal government. 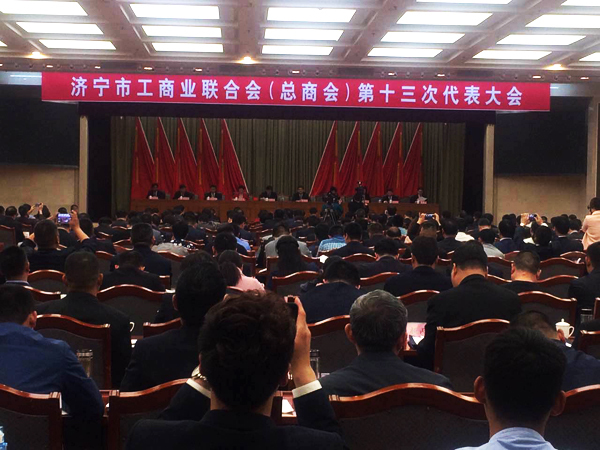 At the meeting, the provincial Federation of Industry and Commerce Party deputy secretary, vice chairman of Sun Zhanjia made an important speech. He highly praised the achievements of the 12th Executive Committee of Jining City Federation of Industry & Commerce in participating the politics, investigation and study, economic service and organizational construction. He pointed out that the new leadership should continue to carry forward the glorious tradition of the Federation of Industry & Commerce. Recognize the socialism with Chinese characteristics, recognize the glorious responsibility and historical mission, and constantly improve the scientific level of work, and strive to create a new situation for Jining City Federation of Industry and Commerce work! Municipal Committee, United Front Secretary, High-tech Zone Party Working Committee Baishan on behalf of Jining Municipal Committee held congratulations to the General Assembly. He hoped that the new leadership of the Municipal Federation of Industry & Commerce should take this opportunity as an opportunity to comprehensively improve the ability and level of service development, with a high degree of political responsibility and the spirit of reform and innovation, unite and lead all members and the majority of non-public economic people, make new and greater contributions to City economic construction! The General Assembly elected 86 members of the Municipal Federation of Industry & Commerce 13th executive committee, the 13th city Federation of Industry & Commerce chairman, vice chairman of the Secretary-General a total of 29 people of the new leadership of the Federation of Industry & Commerce; also elected Jining City City Chamber of Commerce, vice president, vice president of the Secretary-General a total of 25 people of the Chamber of Commerce new leadership team. Li Kexue was elected as the president of the Federation of Industry & Commerce, president of the Chamber of Commerce, China Transport Group Chairman and General Manager Qu Qing was elected Jining City Federation of Industry & Commerce Committee, Jining City Chamber of Commerce vice president. Manager Qu said, very honored to be elected as Jining City Federation of Industry & Commerce 13th executive committee executive committee, which mean the organization trust me. It is also the government and the community highly agree with the development achievement of China Transport Group, we are deeply proud of the mission and the responsibility is significant. The next step, China Transport Group will make more efforts under the correct leadership of municipal government, with conscientiously fulfill the mission, high morale and enterprising spirit, unity and cooperation, pragmatic innovation, advancing with the times, to make more positive contributions to the economic and social construction of Jining City!